Remember when Love Letter was the hot new game taking the western world by storm? A fun game, with fun art, and only 18 cards! This was going to be the beginning of a wave of small Asian games hitting the western world. Ultimately it didn’t end up being as big of a wave as people speculated, but we’re certainly seeing more than we would have, ceteris paribus. Oink Games has been one of the most successful publishers in getting games to head west in this post-Love Letter world, and it’s not hard to see why. Nearly all of their games are housed in a small, efficient box with a beautifully minimalist art style. Deep Sea Adventure’s box is jam packed with cardboard and wooden bits that you’ll set up in a semi-freeform manner (no “board” in this board game). The result is a delightful visual presence that will draw in surrounding folk like flies to a light. It’s cute without being saccharine; polished without being garish. Gameplay is light as a feather set up with a ridiculous premise. You’re all old-timey deep sea explorers trying to discover treasure. The only problem is that you, collectively, can only afford one submarine and one shared oxygen supply. A classic blunder. The result of this madness is a compelling push your luck game with a surprising amount of teeth behind its quaint appearance. 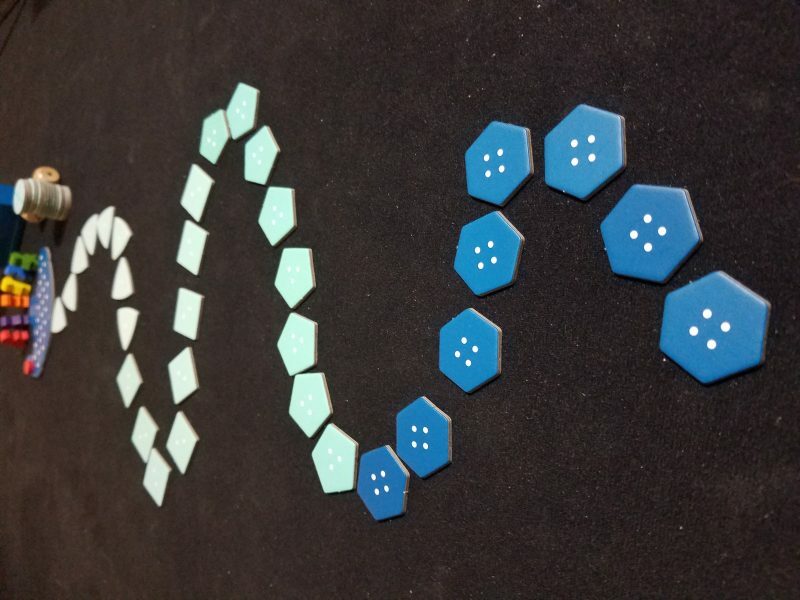 It’s also one of the few games that uses roll and move well. 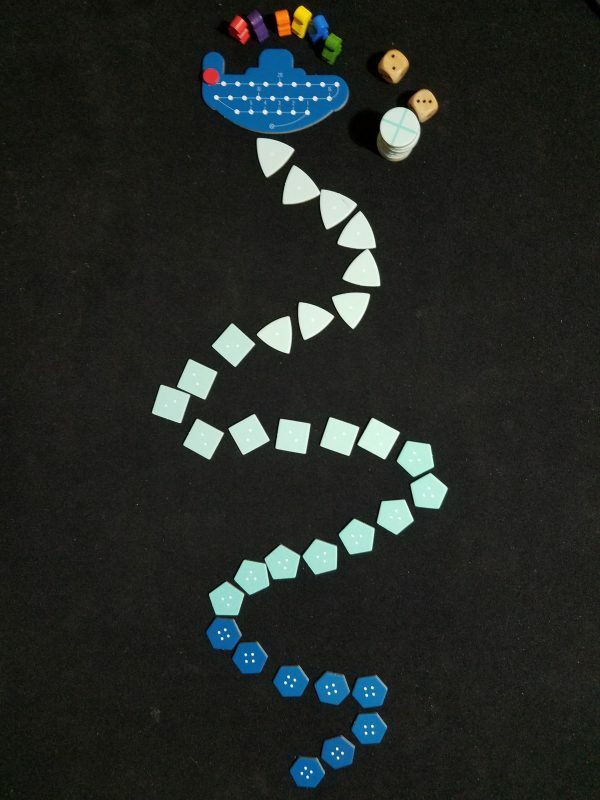 On your turn, you’re going to roll 2d3 dice and move down the winding path towards the bottom of the sea. As you go further and deeper, the treasure gets more lucrative, but you have to lug it back up to the sub before the oxygen runs out or you don’t get any points at all. The twist is that oxygen doesn’t start depleting until someone picks up a piece of treasure. Everyone may want to take their time, dive down deep, and get a big prize, but as soon as someone takes anything, the race is on. Oxygen drains so quickly, and part of the fun is not telling new players precisely how much trouble they’re actually in when they decide to push their luck and go deeper. Compounding the impending doom is the fact that your movement is slowed down for each piece of treasure you hold. Diving down is easy, but getting back up is another matter. You’re going to feel the weight of each individual piece of treasure, and given that the average die roll on a given turn is 4, even with one or two prizes in tow you’re going to need a significantly greater number of turns to get back compared to the dive down. It’s the double whammy of moving slower and the end of the round accelerating on you that punishes hubris so readily. It also creates the major weakness in Deep Sea Adventure, which is that once players know what they’re doing, the game more or less plays out the same each time. It’s an interesting game theory experiment, because while players may agree to delay taking any treasure until they reach the bottom, whoever defects from that agreement gets a small advantage. I haven’t yet seen someone not defect. Typically once someone gets an advantageous roll (such as landing on the first spot in the next tier of treasure tiles), they’ll take a treasure, triggering a cascade from the rest of the group. If someone overshoots where they want to go, they’ll grab one on the way back up to be safe. Second treasures aren’t taken until the player is pretty certain they can get it back in time. Of course, the appeal of a push your luck game isn’t in deep strategy. One as simple as this will always be an exercise in basic probability, but once you get past the initial learning curve of understanding DSA’s particular cadence, the number of interesting decisions shrink. Imagine a graph of your return voyage success rate probability. As each round progresses in the beginning your probability may lower a hair, but once people start taking treasures that line will start dropping at an accelerated rate. Getting to the point where you understand when to turn around is interesting, but the success probability difference between turning around one turn to the next could be enormous. It ceases to be a decision of, “ohhh, do you think I can push it one more turn?” and becomes “I have to turn back now or I won’t make it”. Still, that doesn’t mean you can solve the game by any measure. It’s still down to the roll of the dice, and the suspense that brings is wonderful. The game is wisely divided into three different rounds so people get opportunities to catch up and hunt the big treasure. All of the treasure pieces taken each round shrink the game space so the big points become even more easy to obtain as the game progresses. The visuals will bring people to the table, and that gambling/party atmosphere created through consequential dice rolls will keep them there. There are no unnecessary rules here; there’s no flash or ostentatiousness. 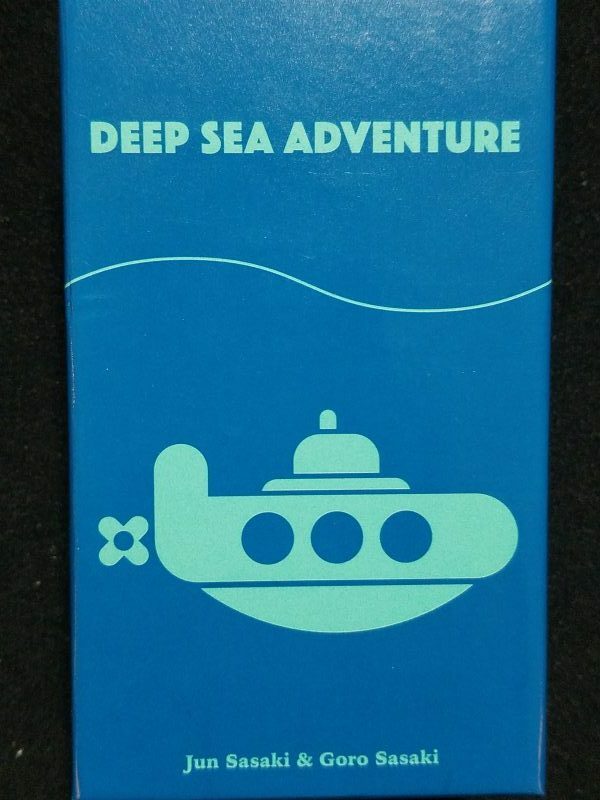 Deep Sea Adventure is exactly what it wants to be and nothing more. This is actually going to be on my “New to Me” post for November, as I just played it for the first time a couple of weeks ago. And my thoughts are very similar to yours (though definitely not as well laid out 🙂 ). I think I gave it a 6 on BGG, but that’s after only one play so I wouldn’t call that a review score. Honestly, if it wasn’t so darn charming my score might be closer to 6. But I can overlook so much because it’s such a well-produced package.